Green Gram Vada and Poppy Seed Payasam(Paravannam) is my ugadi specials but I did not find time to post on that day. Instead I posted which was already ready in my draft. When I posted Sprouts rice I told you that I will give you the recipe for sprouts vada. You can either make this vada using green gram sprouts or just without sprouting. This is so yummy and comes out so so so crispy and lite that you can enjoy thoroughly. Just take a look at my tip section for serving suggestions too. 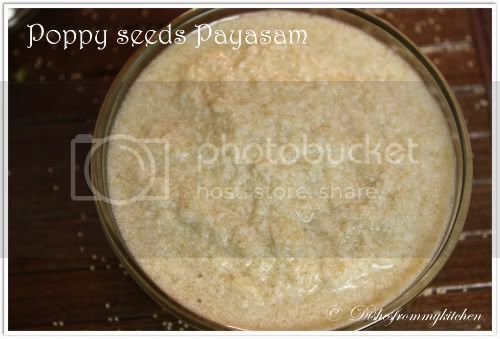 Next is poppy seeds payasam which is our very favorite one that you can make only with 3 ingredients and so easy too. This is one of our traditional payasam. Here is my ugadi specials for your Visuals. 1. Soak the green gram overnight. 2. Grind with other ingredients to very coarse paste or batter without adding much water. 3. The consistency must be like dropping or the dosa batter consistency. 4. Check for salt. Now add the chopped coriander with the batter. 5. Heat the oil in the deep vessel or small wok. 6. Once the oil is very hot, drop the batter to small balls. 7. Leave it for few seconds and give it a turn, when it is crispy and cooked all the sides then it is done. Drain in the paper towel. And serve with coconut chutney. 1. First powder the Poppy seed in the dry mixer coarsely. 2. Now add the sugar and milk. 3. It has to be ground coarsely, don't make it fine as it does not taste good. 4. The consistency should be like dosa batter. Accordingly adjust the milk too. 5. Now cook in the stove top, while cooking it curdles but don't worry it is normal and it is supposed to be like that which tastes so wonderful. 6. At One stage the raw smell of the poppy seed disappears and it starts boiling nicely. Switch off the flame. 7. You can serve it hot or cold. Yummy creamy curdly sweet is ready !!!!! 1. You can substitute the Poppy seeds with Pumpkin seeds(dehusked), Cucumber seeds too. 2. You can substitute the green gram with cow peas( Black eye bean), Alasandhalu( Karamani) too. 1. Once the vada is done you can make curd vada, By soaking it in the curd as we normally do it. Its so tasty. 2. You can serve with sambar and chutney. 3. Can add to rasam to make rasam vada. 4. Another interesting way Which I always do is ..In a mixing bowl add chopped raw onion( finely), Chopped coriander, Dash of lemon and Chaat masala give it a toss and serve in a bowl. Yummy !!!!! This payasam is new to me..looks super delicious.. It's a new dish to me...very tempting! Tasty and healthy vadas. Poppy seed payasam sounds delicious. Love these two a lot Pavithra. Looks very tempting. Vadas look crispy and nice clicks. Me too make these vada with sprouts or plain. Is really healthy and very good for kids. Never tasted poppy seed payasam........sounds interesting.Love the vada too. Looks like you made a lot and i am sure even if yo made a lot there is nothing left now as they look so so good. Poppy seeds payasam is new to me. Your dishes look delicious. super vada & different payasam!! nice clicks!! Crispy vada and tempting payasam both together looks awesome...never tried payasam with poppyseeds, wanna give a try soon.. Both the dishes look so yumm... the payasam recipe is really interesting! 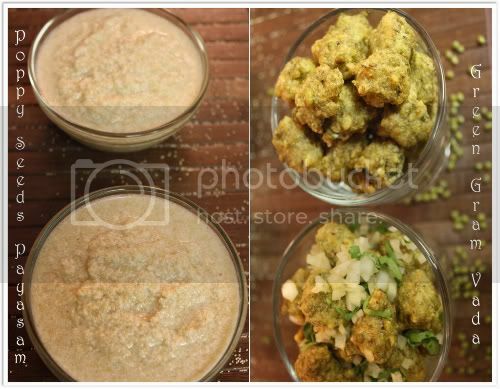 Healthy Vada..looks yummy..I love that payasam too..
Wow.. yummy.. I like that payasam so much. But vada again wont suit me. I am allergic to it. Vada and payasam both dishes looks so tasty and yummy!! Nice photographs you have displayed! the recipes look yummy! Poppy seeds payasam is new to me. Looks so good!Vadai looks healthy and lovely color Pavithra. Vada's look really tasty and delicious .The poppyseed kheer is anew one to me.Never made it before.Looks lovely. Dear Pavithra..Happy Belated Ugadi..Love both the dishes..They are both new to me.. I must say I love ur payasam recipe..I can't believe its just 3 ingredients. 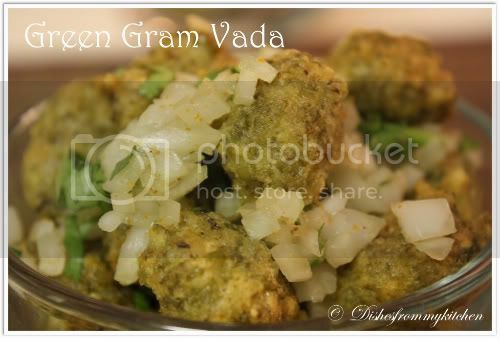 Vadas are so healthy too with the sprouted green gram. I have bookmarked them both..Beautiful Clicks and I love ur new look. Vada looks so delicious. Payasam is new to me and sounds interesting. Poppy seed Payasam is new for me..nice recipe!! both the reciepes are new to me.both looks delicious. nice presentation and click...healthy vada.. 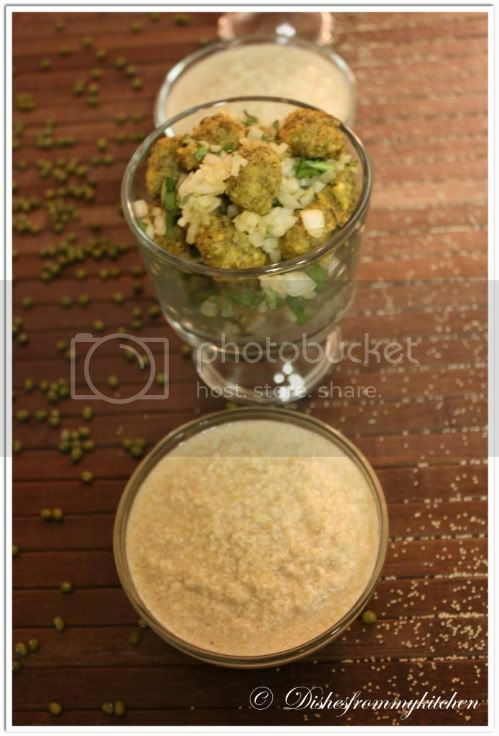 I too make green gram vadai in similar manner, poppy seeds payasam is something new to me, pics are gorgeous! I have never tried these before but oh my goodness, they sure look phenomenal!! The idea of green gram vada is interesting.I tried the khus-khus payasam once and did not like it...probably, I had ground it too fine. Delicious!! Wouldn't mind having these any time!! beautiful pictures Pavithra,i love that wooden background very very much! And the payasam and vadai both are nice,never tasted before! Both are looking yummy and delicious I have never made payasam with poppy seeds.New to me. Two stunning dishes in one post,this combo is irresistible n simply superb pavi.Poppy seed payasam hmmm i would love to taste it since i had never tasted it :( thanks for sharing the recipe pavi.They seem to be so delicious. 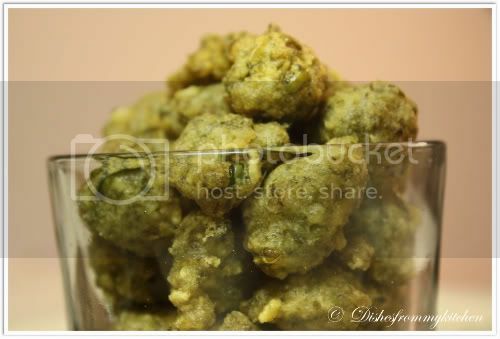 Green gram vada something new! The poppy seed payasam I ve tasted in my in-laws place! Delicious pict! both the dishes look so yummy, Pavithra! poppy seed payasam is a very new dish to me.. looks delicious. These are both new dishes for me. But they look totally delicious! I would love to try them! Loved that picture of green gram vada in the glass bottle. The vada is new to me, though my MIL make the poppy seeds payasam often. I've never had this before, it looks great. Vada and payesam looks tempting, delicious and yummy. Wonderful presentation. Both dishes are new to me. Great recipes!